Photographers need to have awesome books to show the their clients the quality of their work. This is twofold as they also need to show off their photography, design and the photo book options they offer. Studio22 wants to make this easier. We offer a “Sample Album” or “Portfolio Album” discount to ensure photographers can afford to keep their portfolios up-to-date. Contact us now for your discount sample album rate. 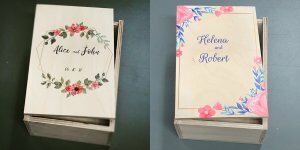 The ordering process is identical to submitting your regular order, whether you choose to upload via our Studio22 Album Maker software or send in your own design. The only requirement for your Sample Album is the placement of the following text tag. This should be in text not smaller that 16 point and appear on the back page or back cover. Please be sure to mention that your book is for Sample or Portfolio use in the ‘comments’ section in the Studio22 Album Maker submission or via e-mail message. Discount will not be applied without the text tag.